ABOUT: This company, a precursor to chains such as Woolworths, Walgreens, and even Wal-Mart, is the subject of an essay by Sandra S. Vance and Roy V. Scott, "Butler Brothers and the Rise and Decline of the Ben Franklin Stores: A Study in Francise Retailing." Essays in Economic and Business History: Selected Papers from the Economic and Business Historical Society (East Lansing: Division of Research, Graduate School of Business, Michigan State University 11 (1993), pages 258-271). They write: "Butler Brothers originated in 1877 as a wholesaler selling general and variety-store merchandise by mail. By the early years of the twentieth century the company served about 100,000 customers through the United States and was the largest firm of its type in the country. Rising chain store competition induced the company to establish in 1927 a chain of francised variety stores under the Ben Franklin name." It sold this chain in 1959. The company headquarters at 230 West Adams in 1900 are pictured below in a cut from George W. Engelhardt, Chicago: The Book of Its Board of Trade and Other Public Bodies (Chicago: The Henry O. Shepard Co., c1900), p190. When Chicago streets were renumbered in 1909, 230 West Adams became approximately 909 West Adams, at or near the corner of Halstead. 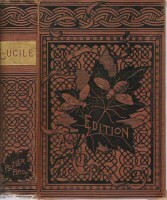 LUCILE’s ISSUED BY Butler Brothers : Only one Butler Brothers edition of Lucile has been reported, as shown below. Tebbel (see my research tools page) mentions in passing that in 1917 the firm handled a large edition of a book by Theodore Roosevelt. All Butler editions thus far seen have been in the firm's own binding which features two bees (for the Bs of Butler Brothers). "Edward B. Butler, of Butler Brothers, wholesale dealers in department store supplies, at 17 Adams Street , was born in Lewiston, Maine , December 6, 1853. When five years of age he removed with his father's family to Boston , Mass. He received his education in the grammar and high schools of that city. His father was engaged in the re­tail grocery busi­ness; and young Butler early ac­quired a taste for mercantile pursuits, by aiding his father in the store. At sixteen years of age he secured a position with a wholesale dry goods and notion house as bundle boy, and remained with this establishment for a few years. He was gradually advanced from one position to another until he reached that of traveling salesman. For five years Mr. Butler sold goods throughout the New England States and Canada . 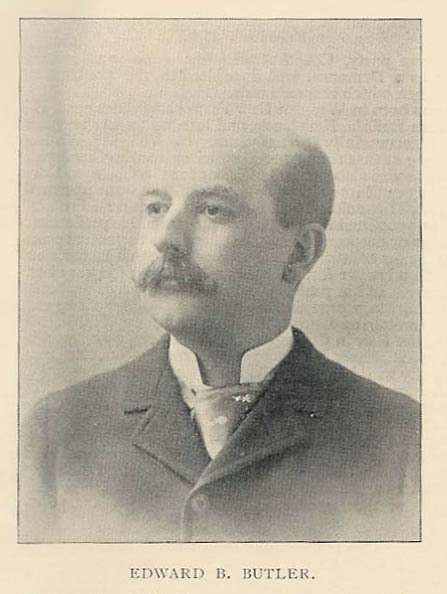 In 1877 he, in connection with his brother, engaged in business in Boston under the firm name of Butler Brothers. The firm did a modest business at first in notions and small ware. In 1878 it inaugurated among the retailers of America the “five cent” counter plan, which in a short time became very popular with merchants everywhere; and the business of Butler Brothers increased very rapidly as a result; they being the only house in the country carrying a line of goods suited to this class of trade. Another original idea of this firm was the issuing of a comprehensive catalogue, sending it out to its customers instead of employing traveling salesman. 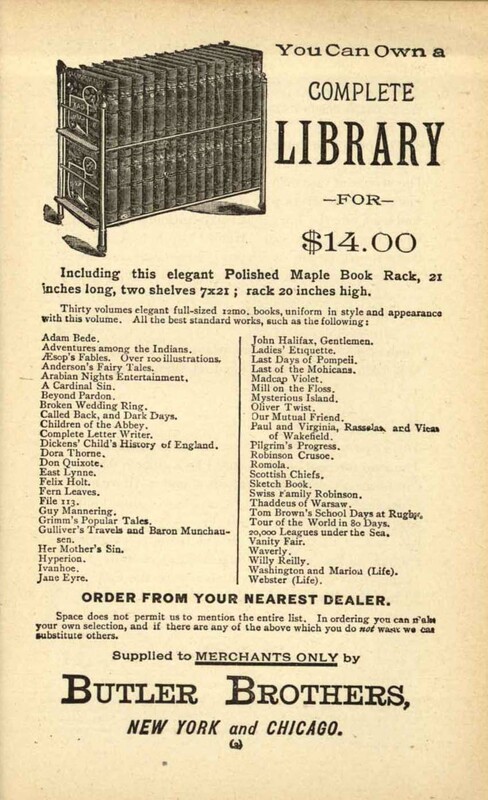 It still issues this catalogue, and has improved it in various ways until it is the most elaborate and comprehensive publication of its kind in America . Some idea of the circulation of this publication may be had, when it is stated that last year forty thousand dollars was paid for stamps for mailing the catalogue of the Chicago house alone. The two houses, that in New York and the one in Chicago employ about three hundred men. Mr. E.B. Butler, the senior partner of the firm, and the only member of the original firm now living, is a resident of Chicago, President of the company, and in full charge of the business here. He is also a director in one of the prominent banks, trustee in four different public institutions, and one of the directors of the World's Columbian Exposition. He is one of Chicago's most charitable wealthy men; one of his most prominent acts in a charitable way was the erection of a building containing a picture gallery, a reading room, and a branch of the public library, donating it to the Hull House settlement, which is located in the midst of Chicago's poor in the southwestern portion of the city. Mr. Butler was married in 1880 to Miss Jennie Holly, of Norwalk, Connecticut . They reside in an elegant home at 3420 Michigan Avenue." BUTLER , Edward Burgess, merchant; b. Lewiston , Me. Dec. 16, 1853; s Manly Orville and Elizabeth (Howe) Butler; ed. Boston pub. schs. ; m. Jane, daughter William Henry Holly, of Norwalk, Conn, 1880. With brother, George H., founded house of Butler Brothers, at Boston, 1877; now at New York, Chicago, St. Louis , Minneapolis, and Dallas, Tex ; dir. Ill. Merchants Trust Co. Chmn, ways and means com., and chmn. Columbian Expn., Chicago, 1893. Pres. For 29 yrs. Glenwood (Ill) Manual Training Sch. ; trustee Hull House, Chicago Orphan Asylum, Girls' Refuge, First State Pawners' Soc., Art Inst. Chicago. Landscape artist; devoted to study and collection of works of art; built picture gallery at his home, 1888, and later on art gallery for Hull House; presented 23 masterpieces by George Inness to Art Inst. Chicago, permanently exhibited in "The Inness Room." Made first exhibition of his own pictures at Art Inst., under an assumed name, 1908; now represented in the Art Inst., Chicago Municipal Art League, Commn. for Encouragement of Local Art (Chicago), Union League Club, Chicago Pub. Sch. Art Soc., Chicago Club, Cleveland Mus. of Art, Dallas Art Assn., Crags Country Club (Los Angeles, Calif.), Los Angeles Museum of Art, Austin, Oak Park and River Forest Art League. Home: 233 East Walton Pl. Office: 440 W. Randolph St. The Department Store -- A Benefit to Mankind. Never in the history of the mercantile world has Anything created so radical a change in the methods of storekeeping as that of the Department Store System of the present day. The "Department Store" is the outgrowth of the cheap counter business originated by Butler Brothers in Boston about ten years ago. The little "Five Cent Counter" then became a cornerstone from which the largest of all the world's branches of merchandising was to be reared. It was the "Cheap Counter" which proved to the progressive merchant his ability to sell all lines of wares under one roof. It was the Five Cent Counter "epidemic" of '77 and '78 which rushed like a mighty whirlwind from the Atlantic to the Pacific, and all along its path transformed old time one line storekeepers into the wide-awake merchant princes of the present day. It was this same epidemic which made possible the world famed Department Stores of Houghton, of Boston; Macy, of New York; Wanamaker, of Philadelphia; and Lehman, of Chicago. To the casual observer the enormity of the volume of a year's business in this line may not be apparent, but from estimates procured from no less a reliable source that the great house of Butler Brothers itself, we learn that the surprising amount of $60,000,000 per annum is but a minimum calculation of the Sales of Department Stores' goods in the United States alone. The vast amount of good accomplished through the work of the Cheap Counter and Department Store is beyond calculation. There is no reader of these lines but should under obligation to the originators of this 19th century wonder for its results in bringing down the cost of more than ten thousand staple household articles to a "popular price" basis. It has enabled the poorest cottager to have a supply of working utensils at prices within her reach, instead of continuing the old method of making one article serve for a dozen uses. It has given the mechanic work, it has taught the business world the problem of quick sales and fair profits when combined with quantity purchasers. The mechanical labor on this class of merchandise is much greater in proportion to its monetary value than on any other production, and this business, when viewed from a labor standpoint, is one to be universally encouraged. Mr. Butler, of the well-known jobbing house of Butler Brothers, was asked by our representative to give him, if possible, the number of workmen required in the manufacturing of the enormous product which daily passes through this firm's hands, and it was shown that, including the 3,000 people in the manufactory of their staple and fancy goods in foreign countries, there were no less than 8,500 men, women and boys working every day in the year on their wares alone. The cities and larger towns are rapidly being supplied with Department Stores. The merchants -- or rather far seeing ones -- are learning that they must either take the initiative in this direction, or else leave the field open to some outsider, who may be looking for just such an opportunity and so ripe an opening. It is really astonishing to listen to Butler Brothers' recital of the many substantial successes made by customers with the smallest possible amounts of capital, in the Cheap Counter and Department Store Business. They tell us that in most cases the Department Store has grown out of a 5, 10 and 25 cent Counter beginning, and they mention the names of at least a dozen firms that had started but a few years ago with a mere nothing, and who, to-day, are rated at upwards of $100,000 each. We have quoted rather freely from Messrs. Butler Brothers in this article, and had we the space, we would feel justified in going still further by telling of the phenomenal growth of this estimable house, as well as the world famed business which it has created. We could preach a whole sermon with a text taken from their success on the "Possibilities of Printers' Ink as a Trade Solicitor," and our entire argument would be left with the single fact of the mammoth business of the house of Butler Brothers (New York and Chicago) having been done solely with the aid of their original "get up" in the shape of a price-list, called "Our Drummer," which they have been mailing free to all merchants during the past ten years, and that in all this time they have never sent out a traveling man. Therefore, kind friends, take pride in the Department Store of your town and see to it that it is patronized in a liberal manner by rich and poor alike, and if the storekeeper be but the right sort of a merchant, and one disposed to build up a large trade by small profit inducements, you will soon discover that the town center has changed its base, and that the threshold of the Department Store is now the hub from which all people radiate. -- From the "American Storekeeper".